I’m a creative at heart (you tend to be in this industry) and this evening I’m off to a cocktail lounge with friends to listen to a live vocalist. 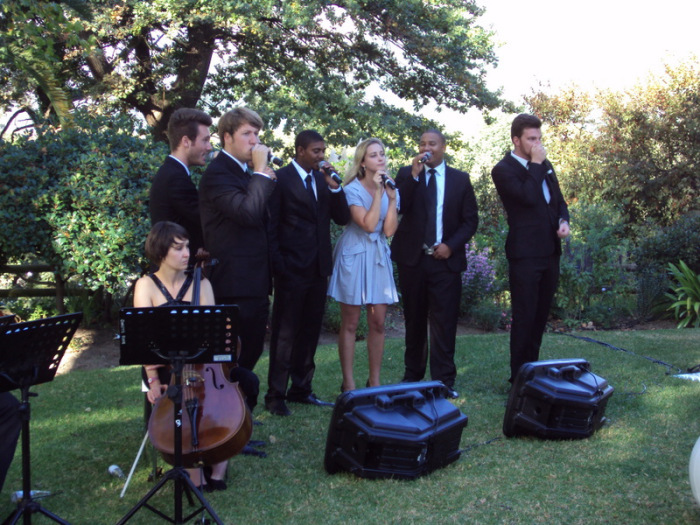 I’ve sung with a group called The White Collar Club… we sang at a wedding in the beautiful wine region of Stellenbosch recently and also performed at the Freeworld Design Centre here in Cape Town. I’ve always loved singing for the fun of it and even completed a short jazz vocal course at this awesome music school. It got me thinking about how you would take singing seriously if you were ever considering it as a full-time career. Here are some simple guidelines for you if you want to become a professional singer, taken from this lovely source. 1. Learn how to sing. This is the foundation of your career as a singer. While there are some performers making a career out of singing when they don’t really sing all that well, it’s those people who hone their craft as singers and continually improve their form and ability who command the most respect as singers. 2. Singing requires good breath control.The voice is best described as a wind instrument and breathing is 80% of singing. Proper singing begins and ends with proper breathing. This is the breathing that we all did as babies, the breathing that we all do unconsciously all day. When you breathe from the diaphragm, your shoulders don’t move and your chest barely moves at all. Learn good breathing technique by keeping your shoulders still and focusing on moving your stomach in and out. 3. It’s crucial to relax when you sing. Strain and tension causes poor resonance and tone. Straining your voice is also not the proper way to hit a high note. You should always stay relaxed, control your breathing, and your vocal cords should never become tight or tense. 4. Make sure that you warm up before each session by humming before you actually start singing and rest your voice occasionally so you do not overwork your vocal cords. 5. Study singers whom you admire. How do they sing? What kind of crowd do they cater to? How did they become professional singers? What is their special “signature style”? Don’t be afraid to copy other artists. However, don’t try to become a “copy” of your favorite singer. Listening to and emulating singers is part of your research; you can learn from those that have been successful before you. Then you can combine all that information along with your own sound into a new creation – you. 6. Develop your own style. Experiment with different ways of singing and different types of music and find one that fits your personality and makes the most of your voice at the same time. You want people to be able to recognize your voice when they hear it. Whether or not you know how to sing already, make sure you eventually learn to develop your own personal style. 7. Try to measure your progress every few weeks by recording yourself singing and listening to the playback. Pick two or three songs to use as your benchmark: an easy song, and intermediate song and a difficult song. You can judge the difficulty of your song choices by the difficulty you have with singing them, if you don’t feel you can sing at all and want some suggestions, here are three that everybody knows: Happy Birthday (easy), Frosty The Snowman (intermediate), The Star Spangled Banner (difficult). If you are just learning to sing, do not begin practicing with your difficult song first but work towards mastering it. 8. Get a Singing Job. After developing some level of skill, you will want to test your talents by performing live. Get over your stage fright (if you have it) and start gaining some practical experience by singing wherever and whenever you get a chance to do so in front of a group of people (karaoke bars, clubs, parties, school talent shows or “busking” at local markets). Learn to connect with your audience. 9. Always take good care of your vocal cords. Drink plenty of water,it rehydrates your whole body,and try to eat foods that have a high water content, such as fresh fruit and vegetables. You may want to avoid dairy products as they induce phlegm, especially cheese and chocolate! Sorry! Avoid smoking, drinking alcohol, and even shouting at all costs. The toll on your vocal cords can be enormous. 10. Investing in lessons or a decent singing program, to learn good vocal techniques at home, can really help save your voice. Singing incorrectly can damage your voice. OK, so go the Leopard skin (As long as it doesn’t come from a real Leopard). Wow. So you sing as well? Would love to hear some of your recordings if you have any online. The outfit is breathtaking. Have a great night.